How Long Should You Leave a Dehumidifier On? 1 What Does a Dehumidifier Do? 2 How do Dehumidifiers Work? 3 Do I Need a Dehumidifier? 8 Which are the Best Dehumidifiers? If you’ve noticed mould or condensation in your home, a dehumidifier could be the perfect solution. 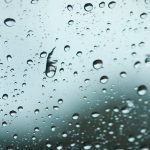 Keep reading to learn whether you need a dehumidifier and how to choose the best option. Excessive moisture is a problem in many homes across the UK. It can lead to unsightly mould, condensation and damp walls – and in some cases can make health conditions such as asthma or allergies worse. If left unresolved, damp can eventually damage clothes or electronics, cause wallpaper to peel and lead to an unpleasant smell. Fortunately, a dehumidifier can often solve damp problems quickly and relatively cheaply. What Does a Dehumidifier Do? We often think of the air in our homes as just empty space. This is fine most of the time, but it’s not really the case. 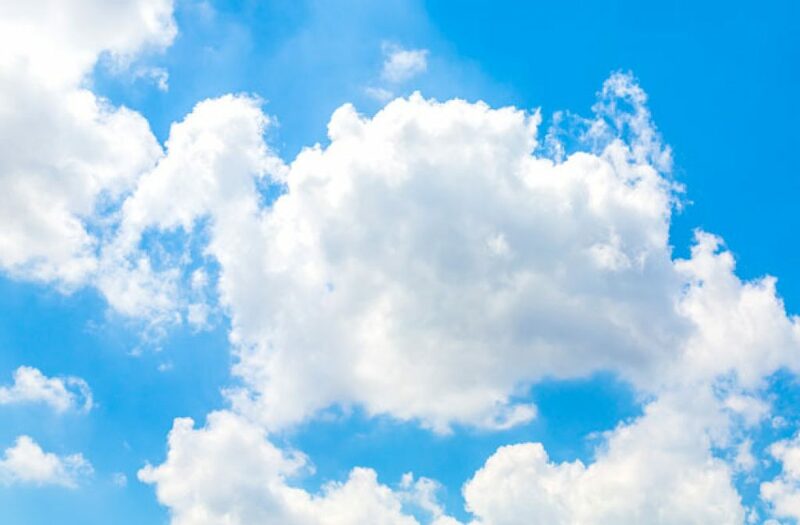 Just like clouds show there is water in the atmosphere, there’s a lot of water – or humidity – in the air of your home. This humidity comes for a variety of sources. Some of the most common include drying laundry and boiling food. As humidity levels rise, condensation forms on windows or even walls, which is one of the first signs of excessive humidity. A dehumidifier’s job is to maintain relative humidity levels. It does this be drawing in air and removing moisture, before releasing the air back into the environment. The water then drips into the tank where it can be emptied. Clouds are a good example of how air can hold moisture. But what exactly is relative humidity? Technically, relative humidity is how much moisture the air is holding compared to how much it can hold. The reason this is different to “regular” humidity is that the amount of water air can hold changes depending on temperature, with warmer air able to hold more. This is why condensation forms on windows. The warmer air inside a home hits the window and cools, which means it can hold less water. If it was already close to saturation, some of the moisture is forced to condense during the cooling process. The ideal range of relative humidity is around 40-60%. This can vary depending on the time of year, but keeping humidity in this range reduces many of the negative effects. A high-quality dehumidifier can maintain humidity levels in this range throughout your home, garage, boat or other interior. The EcoAir DC12 is an example of a refrigerant dehumidifier (also known as a compressor). At a basic level, all dehumidifiers follow the same process. They start by pulling in air from the surrounding environment before removing moisture into a tank. The drier air is then pumped back into the room. There are, however, several methods to extract moisture. The two most common are refrigerant and desiccant. Desiccant Dehumidifiers. Once air has been pulled into a desiccant dehumidifier, it is passed over a material to absorb moisture. A heater then raises the temperature of the material, causing the water to be collected in the tank below. Click here for a full explanation of desiccant dehumidifiers. Refrigerant dehumidifiers. Unlike desiccant dehumidifiers, refrigerant models use a compressor to cool coils. Air is then passed over the coils, causing water to condense (like on a window) before dripping into the tank below. Click here for a full explanation of refrigerant dehumidifiers. We’ve reviewed excellent dehumidifiers of both types, so there isn’t a “best” option. As desiccant dehumidifiers don’t use cooled coils, however, they are recommended for cooler environments. Refrigerant dehumidifiers are generally more energy efficient, but are most effective in warmer rooms. Not every damp or mould problem requires a dehumidifier. In fact, we recommend you try other methods first. If they don’t work, a dehumidifier can quickly reduce humidity. Drying laundry inside can release large quantities of water into your home. Ventilation is vital for reducing humidity. Make sure you use extractor fans, especially when cooking or having a shower, and try leaving them on a bit longer. If you don’t have a fan, leave the window open in the bathroom for 10-15 minutes after a shower. Dry your clothes outside or while the windows are open. 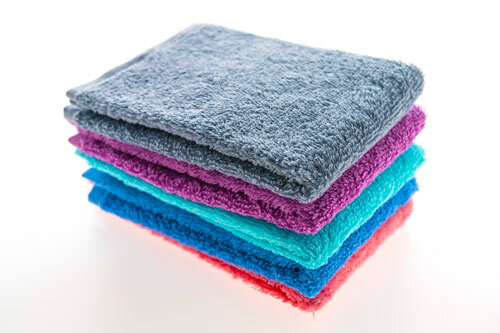 This isn’t always possible, especially if you live in a flat or home without a garden, but wet laundry is one of the biggest sources of moisture in the home. If you have a tumble dryer, check that the vent is properly working and taking moisture outside. Leave your bedroom window open for 10-15 minutes each morning. This allows moisture from breathing to escape. If you’re having trouble reducing the humidity in your bathroom, take shorter and colder showers. Cover your food while cooking. This stops moisture escaping into the air. If you have a fireplace, dry wood in a shed rather than inside. Fresh firewood can hold a lot of water. Check your roof isn’t leaking. Make sure your washing machine isn’t leaking when in use. These tips can have a surprisingly quick effect on humidity. But if you try them and find that your home is still damp, or the tips aren’t applicable to your situation, getting a dehumidifier can be a great option. Another reason you might need a dehumidifier is if you have a dust mite allergy. Dust mites can’t survive with humidity at less than 50%, so keeping humidity below this stops them breeding. If you’ve decided a dehumidifier is the best option for tackling mould and damp, the next step is choosing the right model. With a variety of options on the market, however, this isn’t always easy. Here’s an overview of some of the most important considerations. Dehumidifiers range in price from around £90 up to £250. The majority of dehumidifiers for homes cost around £100-£250. As a general rule, the higher the extraction capacity (how much water a dehumidifier can remove in 24 hours) the more you’ll need to pay. We’ve written a guide to sizing your dehumidifier, but the larger or damper a home the bigger capacity you’ll need. If you want a mid-range dehumidifier that’s suitable for medium-size homes, a budget of £150-£200 includes many of the best dehumidifiers. If you have a large home, or want advanced features such as daily timers and digital control panels, you’ll probably need to stretch to £200-£250. Keep in mind that spending more doesn’t always mean a higher quality dehumidifier. That’s why it’s important to read our dehumidifier reviews before you buy. We’ve talked a lot about the various types of dehumidifier – but which is best for you? Here’s a quick overview. Refrigerant dehumidifier (also known as compressor dehumidifiers). This is the most common type and works best in warmer conditions. The best refrigerant models are highly energy efficient and fast at extracting water. If you only need a dehumidifier for heated rooms and aren’t concerned about noise levels, a refrigerant is probably the best option. 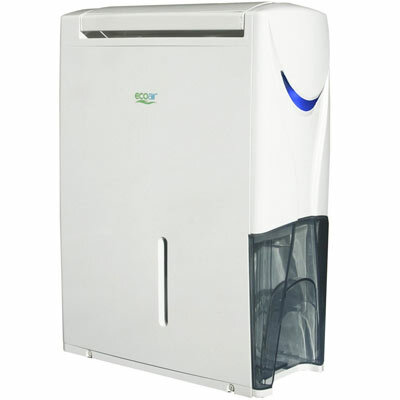 Desiccant dehumidifier. These are more effective in cooler conditions than refrigerant. They are also quieter and lighter as they don’t include a compressor or coils. For these reasons, desiccant models are recommended if you need a small dehumidifier or a dehumidifier for cooler environments (such as garages or conservatories). They are less energy efficient though, so for warmer environments you may want to choose a refrigerant model. The capacity of a dehumidifier doesn’t refer to its physical size of even its water tank. Instead, its capacity is how much water it can extract during a 24 hour period. This value is the amount in ideal conditions, so the machine is unlikely to reach this number in the typical British home. Even so, the capacity is important as it’s an easy way to compare the extraction capabilities of two dehumidifiers. We’ve written a full guide to choosing the right size for your dehumidifier. The guide includes a table for working out the minimum capacity you’ll need depending on the size and humidity of your home. It’s common to move a dehumidifier around depending on where it’s needed most. Bulky and heavy dehumidifiers, which can weigh over 13kg, can make this difficult. For this reason, it’s important to take into account the physical size and weight before you buy. If you’re going to use it in a small room, you may also need a compact model. On a side note, you may want to choose a dehumidifier with wheels and a proper handle – especially if you think you’ll have trouble carrying it. 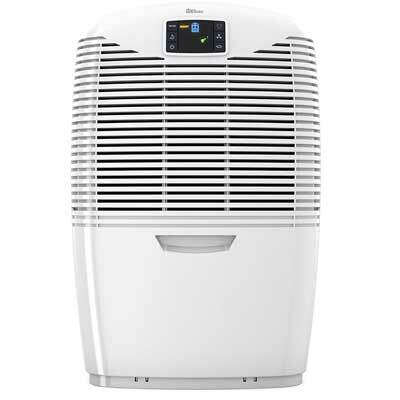 Unlike cheaper models, the EcoAir DC202 comes with a 5-stage filtration system for cleaner air. Off Timer. A timer allows you to set the machine to turn off after a defined period of time. This is a handy way to save energy. Auto-defrost. When temperatures drop too low, water on the dehumidifier’s coils can start to freeze. Auto-defrost mode allows the machine to unfreeze before continuing to dehumidify. Automatic humidity monitoring (humidistat). Many dehumidifiers can monitor the humidity of the environment. This allows them to switch on or off depending on whether the humidity has reached your desired levels. Automatic modes reduce the need to micro manage your dehumidifier and can also save energy. Auto-reset. This function allows a dehumidifier to restart without changing settings after it loses power. Extra filtration. Some dehumidifiers include additional filtration systems to purify the air. Brand. 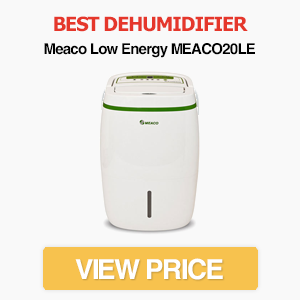 It’s usually best to buy from a respected dehumidifier brand, such as EcoAir, Ebac and Meaco. 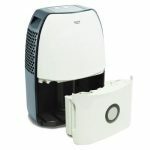 There are exceptions, however, so we review dehumidifiers from a range of companies. Energy efficiency. Energy efficiency can be difficult to judge, but there are a few rules to follow. Refrigerant models are usually more energy efficient when used in warm environments, but they become less so as temperatures cool. Desiccant models use more energy, but can quickly remove water and also work consistently in cooler temperatures. Some dehumidifiers also have multiple settings to reduce energy consumption at the expense of extraction speed. Dehumidifiers rely on an unobstructed airflow to maximise their effectiveness. While some have vents on the top, most have them on the back. This means there needs to be a space between the dehumidifier and the wall. We recommended at least six inches around the dehumidifier. Follow the tips above for reducing humidity even if you have a dehumidifier. This will reduce energy consumption. Regularly clean the filter so it doesn’t get clogged. Just like a vacuum cleaner, a dirty filter reduces the effectiveness of a dehumidifier. Make sure you check the manufacturer’s instructions on how to safely clean the filter first though. If your dehumidifier has an automatic function, it will automatically switch on and off depending on the humidity. A good compromise between health benefits and energy cost is 50-60% humidity. You may want to set it lower than this on the first few uses, however, to bring humidity down to a manageable baseline. Which are the Best Dehumidifiers? 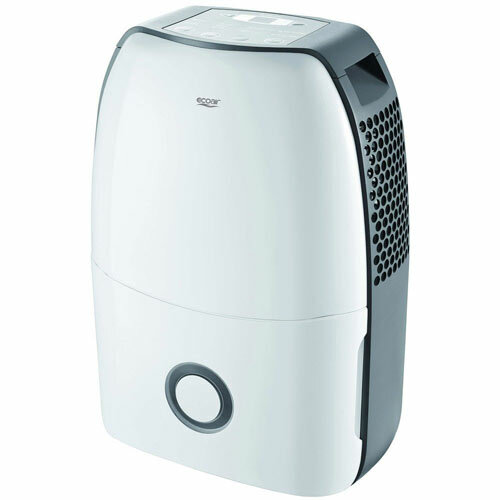 We review a variety of dehumidifiers from brands such as Ebac, Delonghi, EcoAir and Meaco. 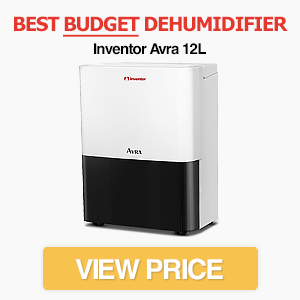 There are a number of great options on the market, but we’ve picked our favourites and listed them on our page of the best dehumidifier models. If you’re ready to start looking for a dehumidifier for your home, that’s the best place to start. GUIDE: What Size Dehumidifier do You Need? EcoAir DC18 Review - Is This the Best Home Dehumidifier? Does a Dehumidifier Kill Mould and Mildew? Why Isn’t My Dehumidifier Collecting Water? Have a question? Leave a comment! ChooseDehumidifier.co.uk is a participant in the Amazon EU Associates Programme, an affiliate advertising programme designed to provide a means for sites to earn advertising fees by advertising and linking to Amazon.co.uk. Prices listed on this website may change without notice. We do our best to keep all prices up-to-date, but can't guarantee their accuracy. We are not responsible for products sold or actions taken by our affiliate partners. Click here to read our full affiliate disclaimer.